As we continue this series on Node.js performance monitoring, let's break down event loops into their components to understand the debugging process better. The event loop cannot process multiple tasks simultaneously. Instead, tasks are placed in a queue and processed sequentially. This means one task can be held up because the one before it is taking a long time to complete. A bottleneck can be identified by observing an abnormally large amount of lag between processing asynchronous tasks. Because all task execution originates from the event loop it is the best location for initial bottleneck measurements. An event loop without lag (we'll consider "healthy") will show that no task has been queued to wait for the completion of another task. Instead, they are all processed the moment they are received. Currently, N|Solid is an easy way of debugging and gaining insight into your Node.js applications, a complete drop-in replacement with no code modifications. 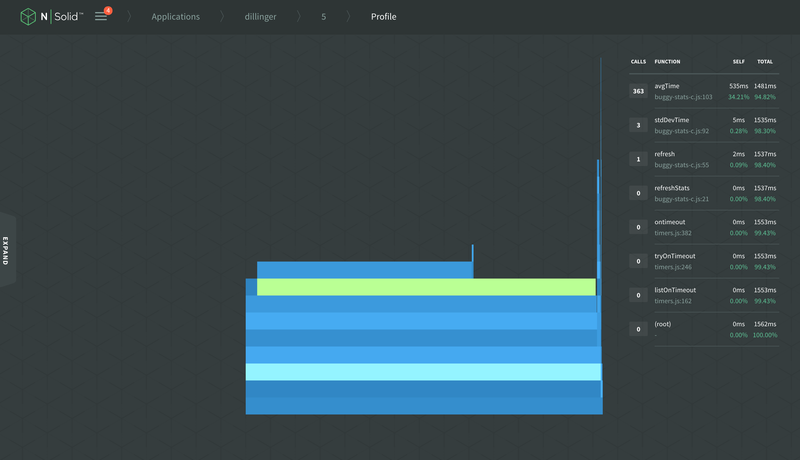 With the N|Solid StatsD interface, you can easily view real-time metrics into the health and performance of your Node.js event loop in your preferred APM tool. N|Solid provides nearly 50 application metrics with the following focused specifically on providing insight into the event loop. loopIdlePercent: Percent of time that Node.js is waiting for I/O ("idle"). loopEstimatedLag: The amount of time an I/O response may have to wait before being processed. loopsPerSecond: The amount of event loop "turns" elapsed in the last second.